An oldie but goodie from the great Chronixx over a minimal 1990’s-like rhythm track that’s just been played over the soundsystem at the annual party and barbecue on the estate behind us tonight. It’s been said it’s good to talk to plants, well I hope the vegetables at the bottom of the garden are listening to the other good tunes being played at the party. Especially the seed onions and the spuds that I put in after an early morning visit to Shannon’s today. It’s definitely that time again! I popped into Shannon’s today as I had a day off work and procured a small pack of first early seed potatoes, Pentland Javelin. 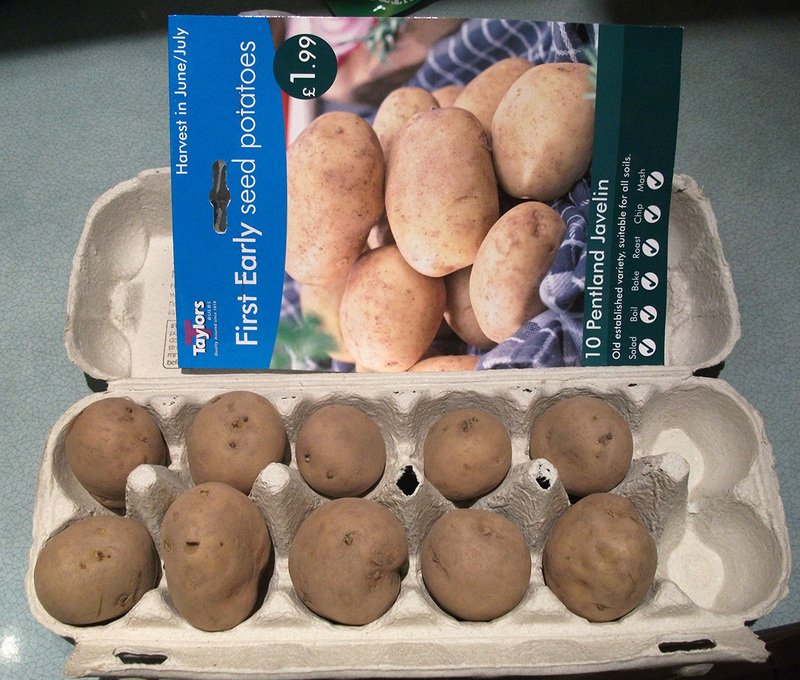 Just like the last couple of years I’ve stuck my seed spuds in an egg box with the blunt end of the tuber upwards (the end that has the “eyes”) to give them a head start come the spring (aka “chitting”). The process of “chitting” encourages the seeds to sprout before planting them outside. We’re not talking the long pale shoots that you see when potatoes have sprouted after being stored in the dark, but ones that are short and sturdy. The important thing with “chitting” spuds is to make sure the container is in a cool position with natural light and where’s there’s no risk of frost. I’ve stuck mine next to the propagator on the floor in the back room by the patio doors. A couple of years ago we were emailed a great tip from Shirley Calgary who said “Actually you do not need the whole potato – I have cut the potatoes in 2 or 3 pieces as long as you have a sprouted or sprouting eye you are all set.” Great stuff! More on chitting here. 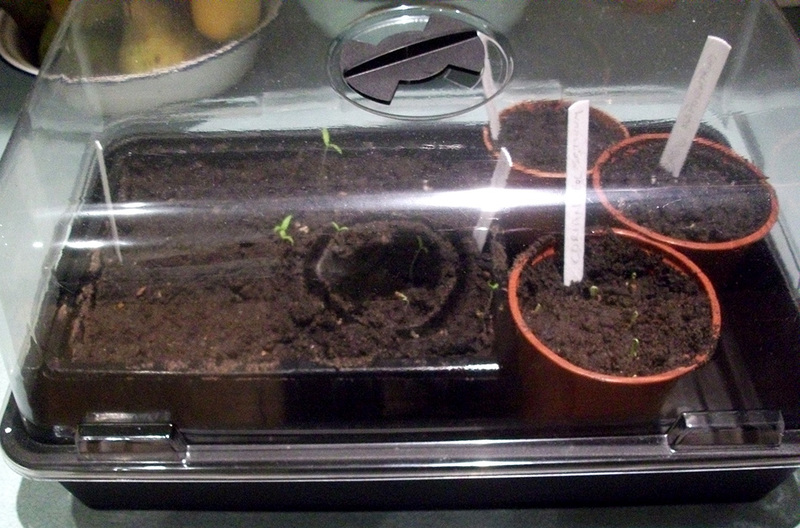 As for the propagator (post here), the seeds I put in last week have started to come through. How good is that? I know it’s early and I’ll be left with leggy tomato and pepper plants on the kitchen windowsill in the spring but why change a habit of a lifetime? Pound shops, don’t you just love ’em! Those plastic builder’s buckets with handles on they sell cheap have come up in conversation a couple of times this week funnily enough. 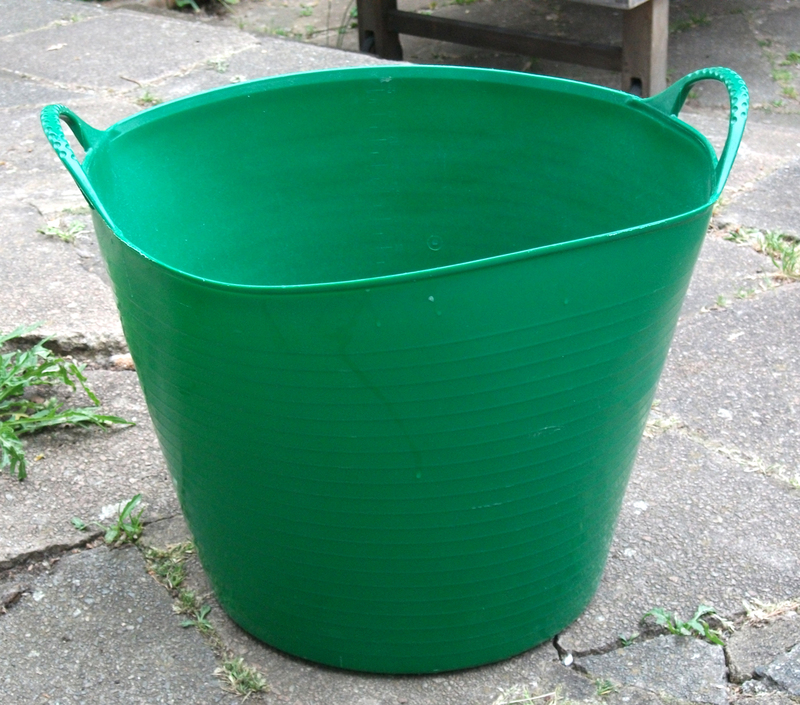 My mate Will used one to scoop out the water from his kid’s bath to put on the garden thus foiling the hosepipe ban during last week’s mini heatwave. It’s funny, as today it was freezing cold and was tipping it down like there’s no tomorrow. Where’s that heatwave gone when you need it over the bank holiday weekend? Yesterday afternoon I was “tipping around with a hoe” with hot sun burning the back of me neck but today was soaked to the skin just walking down to the compost bin. What’s all that about? A big ta to Edward for telling us his top tip last wednesday of drilling some drainage holes in the bottom of the plastic buckets and using them to grow spuds in. 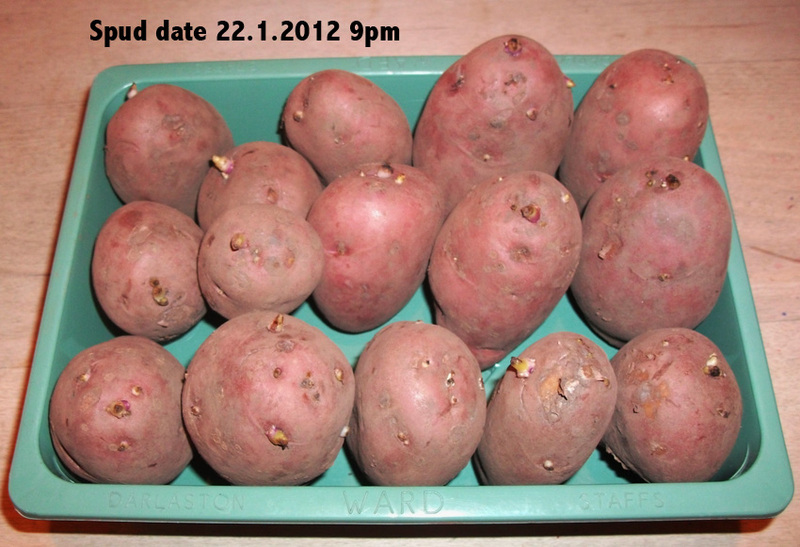 Using seed potatoes he has left over from the main plot he puts in one per bucket and then puts them in the greenhouse. If you’re lucky enough to have a greenhouse you could put spuds in at varying times of the year thus elongating the cropping season. Bob Flowerdew mentioned he loves keeping some seed potatoes over so he can sow them indoors just after xmas so he’ll have new potatoes for Easter. Good idea eh? I haven’t got a greenhouse but the old window frame I found in the street that doubled as a cold frame has turned up trumps as the potato plant started early on in the year under it is flowering now so it won’t be long now till we have some new potatoes for dinner! I found the hanging basket in a skip a year or so ago and it was in a right state but after bit of a wash and brush up and some wire wool on the chain, it’s looking good! It’s a bit overcrowded at the moment and as it’s only early in the season I’m sure I will be thinning out the thing but lets see what happens. I’ll be giving it a good feed weekly during the summer and lots of water so fingers crossed. It’s two days of bank holidays now, what’s the odds of getting some good weather? The other week I picked up this great book in Holborn Library. It’s a mine of information following an allotment in Devon from a germ of an idea, how it was set up (with advice on how to set one up yourself, getting grants etc) to how it is progressing now. Loads of information on the tools you need, soil cultivation, crop rotation, what to do season by season, pest control and interviews with everyone involved. 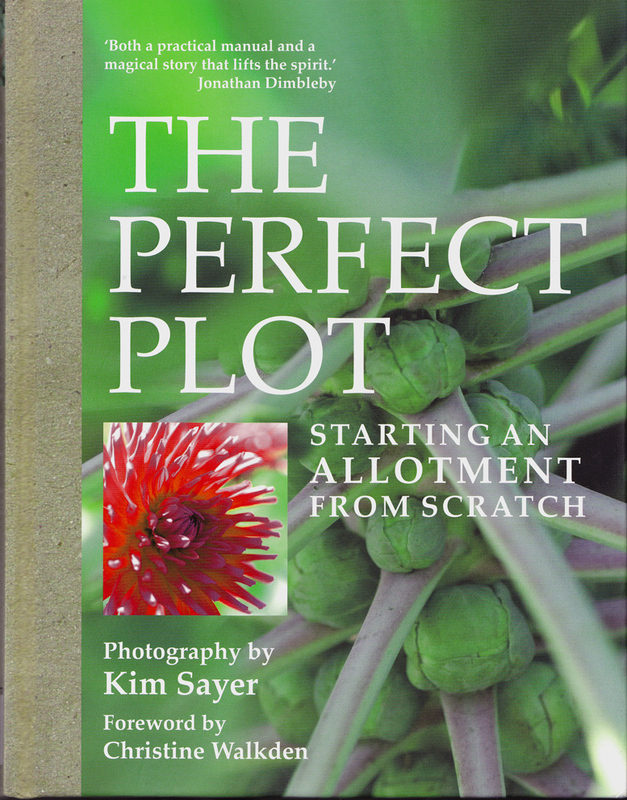 A great read if you’ve just got an allotment, want to set one up or just want to grow stuff in your back garden. One of the main guys even uses the biodynamic method too, excellent! Remember if you haven’t got the cash to spend on gardening books join your local library as it costs nowt (and don’t forget the web either) and if you work in a different town/borough join the one there too as that’ll give your more choice. I’ve library membership for three London boroughs and I don’t think you have to work or live in that borough to join one. On Friday night I saw Goldie talking to Alan Titchmarsh on the telly at Chelsea about his love of Acers. 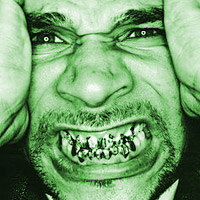 I reckon he might be the next new breed of TV gardener with his tatt’s and gold teeth. What happened to the old percy thrower stereotype in their tweed jacket with leather patches on the elbows wearing a clean shirt and tie while demonstrating “double digging”? Times are a changing indeed! 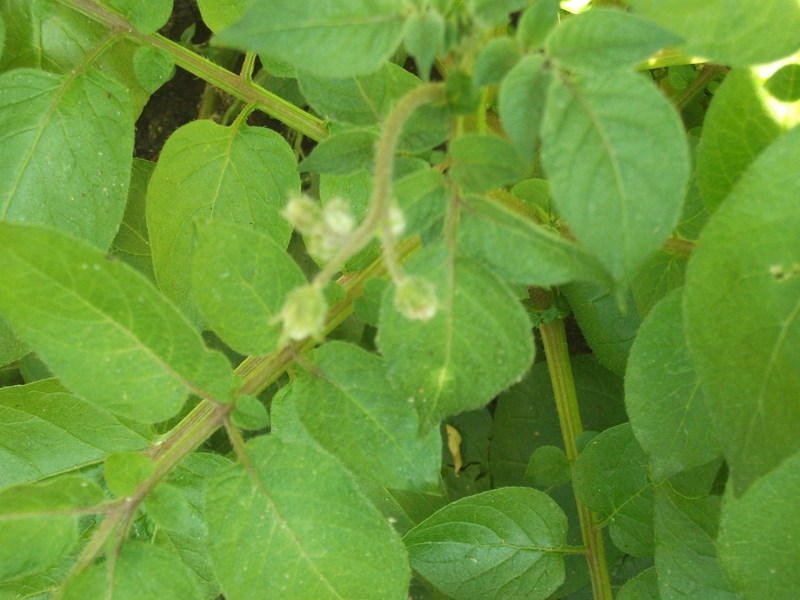 I’ve just noticed some flower buds forming on the super early spuds (below) that were originally started off on the homemade cold frame which are now flying ahead! The ones I put in a month or so ago are starting to get going now as well. Spuds I love em! Jobs done this week: Weeding (just knock them off with a sharp hoe and leave them to shrivel up in this hot weather), mowing the lawn (it does appreciate a weekly cut), staking up tomato plants, tying back passion flower, clematis and sweet peas and giving the garden a good old water in the evening (I do it with using a bucket, it takes me ages but I like it as it gives me some quiet time on me own). Sowed outdoors this week: Dwarf french beans (nice one Will! 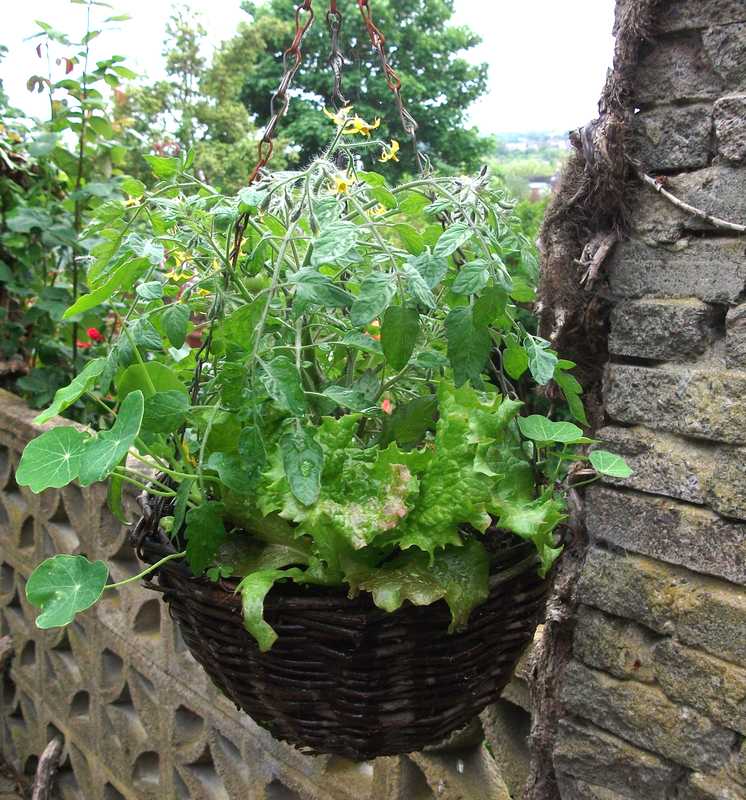 ), climbing french beans, cut and come again lettuce, borage, lemon balm, sunflowers and night scented stock. 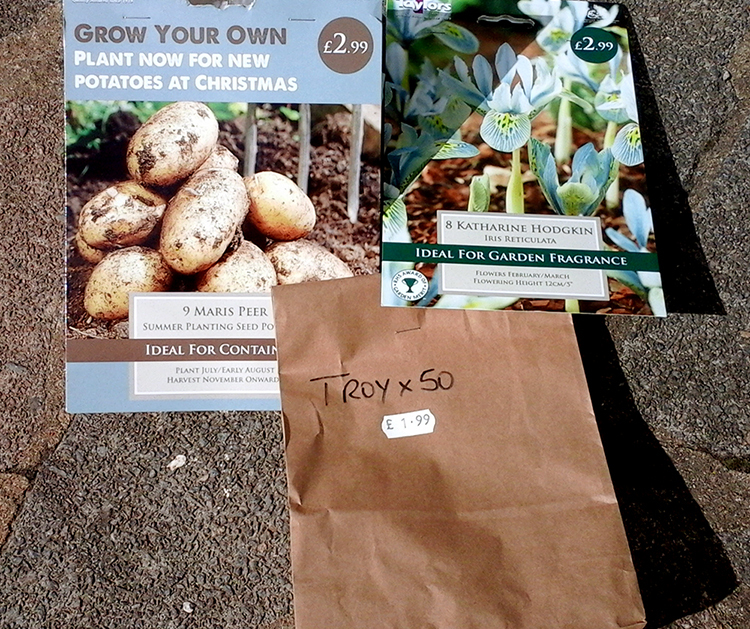 The other week I couldn’t stop myself and popped into the garden centre and got myself a bag of Desiree seed potatoes. They cost us £3.99 for about 40 which isn’t bad, as you’re talking 40 plants that will give you a good few spuds on each come harvest time in September, well worth it! The first thing I’ll be doing is encouraging the seeds to sprout or “chitting” them, which will give them a head-start before planting them outside. We’re not talking the long pale shoots that you see when potatoes have sprouted after being stored in the dark, but ones that are short and sturdy. It’s worth chitting spuds before planting as their shoots usually appear in the ground a couple of weeks before seed spuds that haven’t. All you basically do is stand the seed potato’s upright in a container (a seed tray or a cardboard egg box) with the blunt end of the tuber upwards (the end that has the “eyes”). Make sure the container is in a cool position with natural light and where’s there’s no risk of frost. I’ve stuck mine on the floor in the back room by the patio doors. Fingers crossed I don’t stand on them when I’m half asleep doing me tai-chi in the morning!